You are about to see the only known photographs of the obscure and truly legendary animation studio of Trygve Rasmussen, the impoverished but passionate Norwegian animator who made me realize that however primitive I thought the technology was in the Czechoslovakia I had to deal with in the mid 1960s, that in fact, animation, and all filmmaking, was a process of overcoming limits and over-crossing barriers. Trygve Rasmussem became my all-time role-model to stop bitching, and to get on with it… An incredible and unforgettable animation discovery in an unlikely land! Norway has magnificent fjords, and some say terrifying trolls, but how about an entirely hand-made animation film studio in 1968? When we made it out to Vienna, and I was able to contact and assure my relatives that we were alive and well, we returned to the Czechoslovak border. But I was refused re-entry. Devastating for Zdenka to be locked out, but I was relieved at least that I had her with me. Getting a new Czechoslovak entrance visa for me under conditions of Soviet occupation was going to take time, but we were assured by phone that we would soon be allowed to re-enter the country. A welcome distraction appeared in the form of an offer of two weeks work for us as animation consultants on an American movie production, SONG OF NORWAY. The director, Andrew Stone, hired us to join him in northern Norway to shoot backgrounds and dance sequences. It was a wonderful experience in gorgeous locations. Andrew Stone himself was a crazed has-been – or perhaps “never-was” – but we befriended the young Norwegian cameraman, Odd Geir (Edgar) Saether. Odd Geir seemed the only sensible member of the crew. He told us about animation being done in Norway. One of the animators he told us about seemed to be surreal. His name was Trygve Rasmussen. When we finished with the also surreal “Song of Norway” shoot, and flew back to Oslo, still not having my Czech visa. We went to the address Odd Geir Saether had given us for Trygve Rasmussen. It turned out to be a life-recharging encounter, forcing a rethink of the limitations we were dealing with, working in technology-deprived and communist-bound Czechoslovakia! Rasmussen showed us that the seemingly impossible could actually be achievable! We were stunned by what he showed us, a totally handmade animation film studio! 1968 – Welcome to the world’s only completely hand-made animation studio! Trygve Rasmussen and his home-made animation camera stand. Even the stop-motion film camera was entirely handmade. Unbelievable! Shooting with the world’s only hand-made “suitcase” animation camera! We could hardly believe our eyes! But it was real and no joke! Front view of the amazing mechanism of wood, wire, and bicycle chain! Rasmussen figured out how to do this just by studying a real camera. 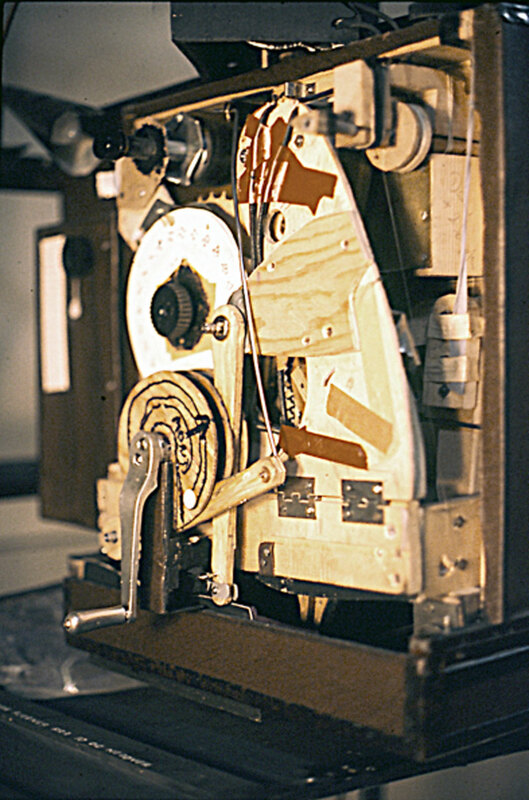 frame-by-frame film pull-down mechanism. Here it is, made by hand! Even the paints were put into little pots made of bent metal scraps. This was Trygve Rasmussen as Zdenka and I met him in 1968. We heard that when Rasmussen died, someone mindlessly threw out his old hand-made camera, thinking it was junk! 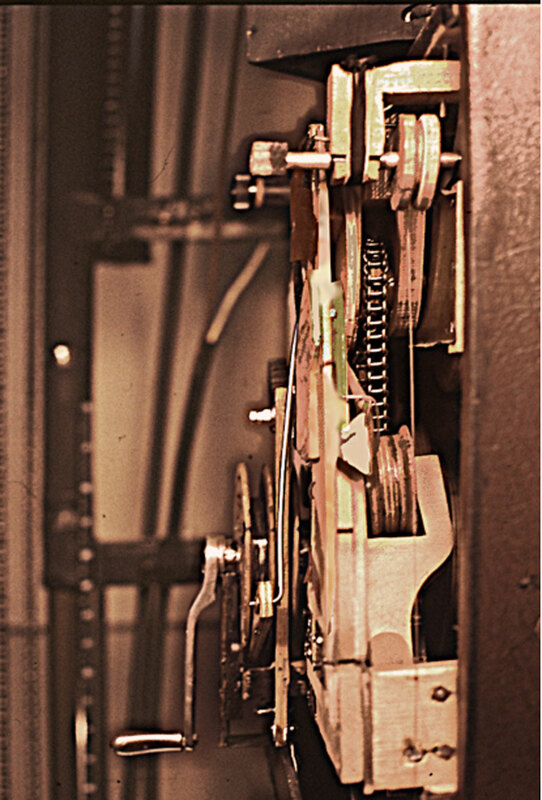 As far as anyone knew whom we asked, I was the only person who had ever photographed its inner workings! The photos reproduced here are the only ones known to exist! Oh how I wish that I’d had a better snapshot camera in 1968! But at least you have the chance to see something of one of the wonders of animation history. Incidentally, the films shot with that “suitcase camera,” were technically and professionally smooth! Rasmussen’s only client was the Norwegian postal service. Somehow he survived, playing the organ at his church, and mopping the floors; one of the little-known heroes of our profession; an inspiration to me; he overcame numbing difficulties to fulfill his passion to animate! We finally got our Czechoslovak visas, and returned to Prague, inspired by Rasmussen. All we had to overcome now was merely the Soviet army! Great stories, Gene Both yours and Zdenka’s , and Trygve’s. Trygve was my ex-wife’s uncle and indeed an amazing artist. He was an accomplished pianist and organist and one of the funniest men I’ve ever met, in spite of many tribulations. I’ll never forget the time we came to dinner, sat in the kitchen and watched the news on a set of double mirrors he’d set up so we could follow what was happening on the T.V. in the living room. His advertising short films are classics, and they are archived somewhere in the Norwegian Film Institute. In one of them, a piece he did for a glue company, an animated horse dances on a piano keyboard, playing Dvorak’s Humoresque Nr. 7. Trygve made sure that the horse’s hoofs hit all the right keys in perfect sychronization with the music which he had recorded himself. Thanks for sharing. This is an amazing story. I think the story of Trygve Rasmussen’s resolve is an inspiration for anyone not only struggling animators. Kudos to him and you for your photographs. Please pass my best regards to Zdenka.